Many of the predictions are clearly influenced by the energy crisis, with many kids predicting there will be tough times ahead without access to cheap energy. However, there's also optimism about space exploration and more than one reference to women as astronauts. Even though Valentina Tereshkova became the first woman in space in 1963, the first American woman (Sally Ride, who died this past summer) wouldn't become an astronaut until 1983 — a full six years after these kids were making their predictions. Interestingly, for being middle schoolers these kids sure seem concerned about high taxes. All of these kids are now between 45 and 48 years old and if you happen to be one of them, I'd love to hear from you. How do you feel reading your predictions from the vantage point of "the future"? How do you feel about the years to come? I think that by the year 2000 we will be in a great depression. People are saying that we are running out of fuel. People will be using machines to do everything. And machines run on fuel. If we run out of fuel we won't be able to run the machines and people will be out of jobs. So we can save fuel. Everybody should try to save by turning their heat to 68 degrees. My view of the future is that we will find more gas and oil. No one will be poor and we all will live in peace! Also in the future, I think they will find some mechanical device that could make kitchens, dining rooms and etc. You'd just push a button and WHAM!! An instant living room or WHAM!! an instant milkshake. And that's my view of the future! I think 2000 will be a good year. I hope so because the last five years haven't been so good with people dying and getting shot and murdered. I will be a grown man by then and will be married. I'll probably have kids. I hope it will be a good America. In the year 2000, I think there won't be any crimes of any kind. Shorter school days and lower taxes. I hope there will be lower taxes and no crimes because I'll be 33 years old and I am sick of crimes and high taxes. I hope woman can be astronauts. I also hope there won't be any pollution. 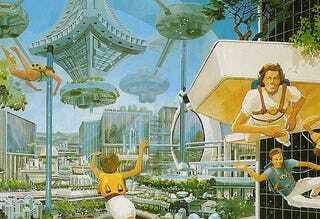 And I also hope there will be town in space, where people live in space capsules. You could push a button and a bed would unfold from the wall. Everything would run on solar energy so you wouldn't have to worry about the fuel shortage. You wouldn't have to go to school. It would be on TV and living would be much easier for everyone. In the year 2000 I will be 34 years old. And actually I don't think kids will have to go to school, because I believe that families will have computers to educate students. That's all for education. I also believe that most of the world will all be the United States of America. I also believe that business and industry will be up 75 per cent. And as for culture, the Model T will be an old artifact. And, if you have children or grandchildren, they'll all be more interested in culture than ever. I think that everything by the year 2000 will be different. I hope the violence will all be stopped. I hope that the computers don't take over people's jobs. I hope by then things will get better.